A big thank-you to CSA members Alex and Jeremy for recommending this recipe. It is taken from Hugh Fearnley-Whittingstall’s book Veg every day. Preheat the oven to 190C / gas mark 5. Heat the butter in a saucepan over a medium heat and add the leeks. As soon as they begin to sizzle, turn the heat right down and cover the pan. Sweat the leeks gently for about 10 minutes, until very soft. Remove from the heat and stir in the mustard, crème fraîche and cheese. Season the mixture well with salt and pepper, as it will be surrounded by a good amount of squash. 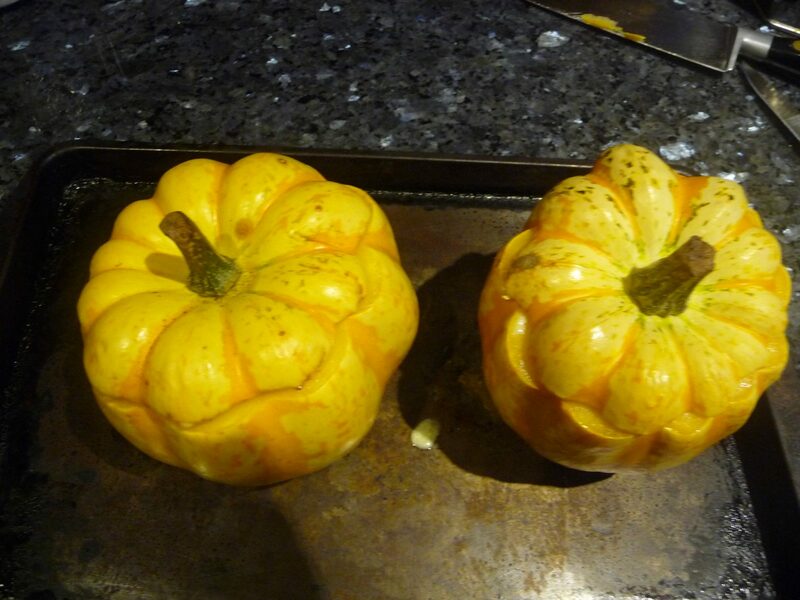 Cut a small slice off the base of each squash so it will stand up on a baking tray without wobbling. Carefully slice a “lid” off the top of each one too and set aside. Now, with a small, sharp knife, cut into the centre of each squash, then use a teaspoon to scoop out all the seeds and fibres. Fill the squash cavities with the leek mixture – they should be about two-thirds full. Tuck a few thyme sprigs into the centre of each. Put the “lids” back on top and stand the squash on a large baking tray – there should be plenty of room for hot air to circulate around them. Bake for 50–60 minutes – possibly longer if the squash are large – until the flesh feels very tender inside. Serve straight away.